Six of my eight great-grandparents were immigrants so I thought I had Ellis Island bragging rights. Even though 40 percent of Americans have Ellis Island heritage, I figured there couldn't be many who had more ancestors who took their first steps on American soil at this famed immigration station, but celebrity chef, restaurateur, and Top Chef judge Tom Colicchio has me beat. I've attempted here to encapsulate his family's entire off-the-boat experience in a single illustration. Each arrival is recorded by surname and year of entry, with a Statue of Liberty icon indicating Ellis Island, a Liberty Bell representing Philadelphia, and a wooden sign designating New York before Ellis Island opened its doors on January 1, 1892. "US" simply means that the individual was born in the United States. If any of the following surnames - Colicchio, Conte, Corvelli, Marino, Melchionna, Migliore, Muscaritolo, Petrizzo, Santasiere, and Schiavino - appear in your family tree, you just might be a cousin (particularly if your family settled in Elizabeth, Orange, or Newark, New Jersey). 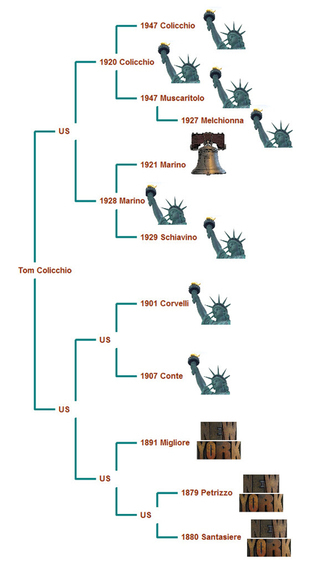 Colicchio's family includes a total of 12 immigrants - eight of whom came through Ellis Island, three more who entered via New York earlier (one just four months prior to its opening), and a solitary ancestor who opted for Philadelphia. Considering that these are strictly direct line ancestors - that is, does not include collateral family members such as great-aunts and great-uncles - eight Ellis Island arrivals is an impressive figure. Generation-wise, two grandparents, seven great-grandparents, and three great-great-grandparents decided to try their luck in America. In one branch, three generations made the trip and in an unusual sequence - a young man in 1920, his grandmother in 1927, and his mother much later in 1947. In terms of timing, one each came in the 1870s, 1880s, and 1890s, two arrived in the first decade of the last century, five made the journey in the 1920s, and the final two brought up the rear in the 1940s. In fact, the lagging pair of great-grandparents only crossed the pond 15 years before Tom Colicchio was born. All dozen immigrants called Italy home, so there's no doubting that Tom Colicchio is 100% Italian. Even his middle name of Patrick, which sounds Irish on the surface, may well be a tribute to his earliest immigrant ancestor, a Petrizzo who Americanized his surname to Patrick.